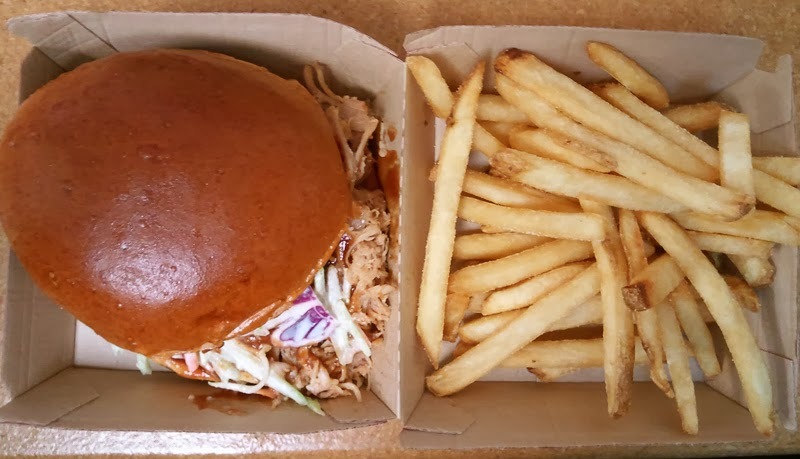 I can guess what you're thinking: "bbq pork at wendy's?" That is exactly what I thought too! But y'all know me. I had to try it. If you want to know more about this delightful southern sandwich served up by a popular middle-western fast food joint then keep on reading. We're going to take a short, sweet trip down barbeque lane. For the record, spell check wants me to spell it barbecue. Ergo, henceforward it shall be spelled bbq. I don't know what is right or wrong anymore. Also for the record, this must be a special test-market sandwich because after a cursory search I cannot find any official media to use as the lead image. (Yay! Special!) 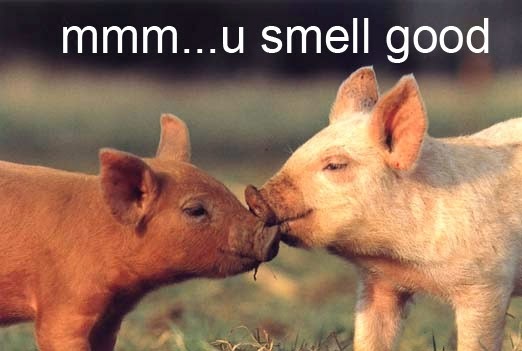 That's where those adorable piglets enter the scene. Because nothing gets the stomach going like looking at the baby version of the animal you are about to eat / have just eaten. So several nights ago I was hungry for dinner and nothing in the house seemed appetizing or worth the effort. And I'm all, "I'm an adult. I can go eat fast food if I want. No one is forcing me to make some sort of poor person's jambalaya using rice, a can of tuna, and some frozen vegetables." Thusly empowered, I bundled up to brave the elements (it's been soooo cold lately, you guys) and make the trek to the promised land (Wendy's). But you know how like you have to decide what you're hungry for before you decide where to drive? You see, at this point I have no idea that Wendy's has bbq pork. So I'm all set for spicy chicken. And when I'm there, I don't really notice the advertisement for bbq pork until after I've ordered. Instead of causing a scene and re-ordering (the teenager probably already pushed the button and doesn't know how to go back), or being a fatty and getting multiple sandwiches, I decide to make a return visit in the near future. Fast forward to a couple days ago. I didn't pack my lunch for work (I normally pack). This would be a great opportunity to eat bbq pork, I think to myself. Off I go, back to the promised land (still Wendy's (in this story)). I'm in the drive-thru. I beat the lunch rush. There's only one lady in front of me (apparently ordering a custom sandwich each for an entire kids soccer team? ), but I can't read the menu from this far back. (Note to self: write an article about drive-thrus). When she finally moves her stupid trophy-wife Acura SUV out of the way, I pull up and confidently order...? I pause. Oh crap! As it turns out, there are three different sauce options. I totally missed this and had to make another on-the-spot call. This is not how I operate. When it comes to food, I only make carefully planned and meticulous decisions. My stress is your payoff. I'm going to tell you about the different sandwich and sauce options so that you don't have to be nervous in line. (Or maybe you don't have crippling anxiety about food purchase decisions). You can't find this information on their website either, so, you're welcome. I'm not saying you owe me, but...you kinda owe me. Right away, you'll notice the "brioche" bun. Then soon afterward you'll see that there is slaw on the sandwich. They call it broccoli slaw. And then you'll ask yourself, "wait, you were taking pictures of your food at work? what if someone saw you? you're that guy." Well someone did see me and I am that guy. Man, the sacrifices I make. You guys really owe me. So it's a little sloppy, but this kind of thing is supposed to be. I mean, it was spilling over the edge, yet the bottom of the bun wasn't soggy, which is important. Oh, beeteedubs, I chose "Smoky BBQ" sauce because I thought it would best represent the spirit of what this sandwich is supposed to be as a sandwich. Yeah, you want that in your mouth. It always takes so long to get to this part. Oh, before we get to the tasting notes, I forgot to mention cost. I got a small combo meal and it cost $6.51. So, it's a "premium" sandwich for sure. Bun - They've got a good handle on the buns these days (that's what she said!). It kept its shape well, wasn't smooshed, etc. Brioche is supposed to be a sweeter, softer, richer bread. Maybe I got some of that, but maybe also it still just tasted like a fast food bun. Like, it was too "manufactured." It definitely wasn't from the quaint bakery down the street. Er, uh, I mean, dans la rue. 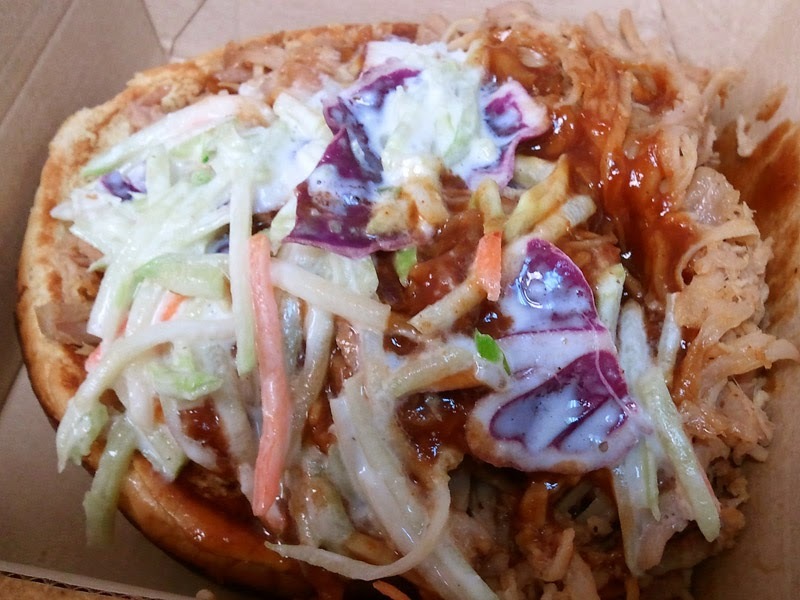 Slaw - They put slaw on it! That's another bold move. Slaw on bbq isn't everyone's cup of tea. As mentioned previously, they're calling it a broccoli slaw. I dunno, I can't tell. What's the difference? I am not a slaw expert. This is a sweet slaw, not a tangy slaw. It provided some crunch where there would otherwise be none. I think they got the ratio correct. Pork - This is where the sandwich is sure to disappoint, right? Yup. It did. I mean, it was fine. It tasted like a fast food pork sandwich. Have you ever bought a tub of pre-made pulled pork from the grocery store? It was like that. Nothing terrible, for sure, but also nothing great. There may have been some preservative flavors in there. This is difficult to rate on a whole because bbq is a very very touchy subject. My mouth has tasted a good amount and variety of bbq and I know I'm still in the kiddie pool of eating bbq. That was a weird mixed metaphor. But I mean, live in the south for a while, you guys. Then tell me what you know about bbq. It will confuse you even more! Certainly, though, Wendy's will never achieve the spirit of bbq. Slow roasting pigs in a pit for 14+ hours. Carefully crafted house sauce. Racist literature for purchase (Maurice's). There is no doubt that this is a very conservative, homogenized, gentrified, suburbia version of a barbeque sandwich. And it doesn't claim to be otherwise. For sure it beats a McRib. I think it would do fine as a seasonal sandwich. It's not a fulltime player, though. And even being just okay, I want to try the other sauce flavors and other serving options. 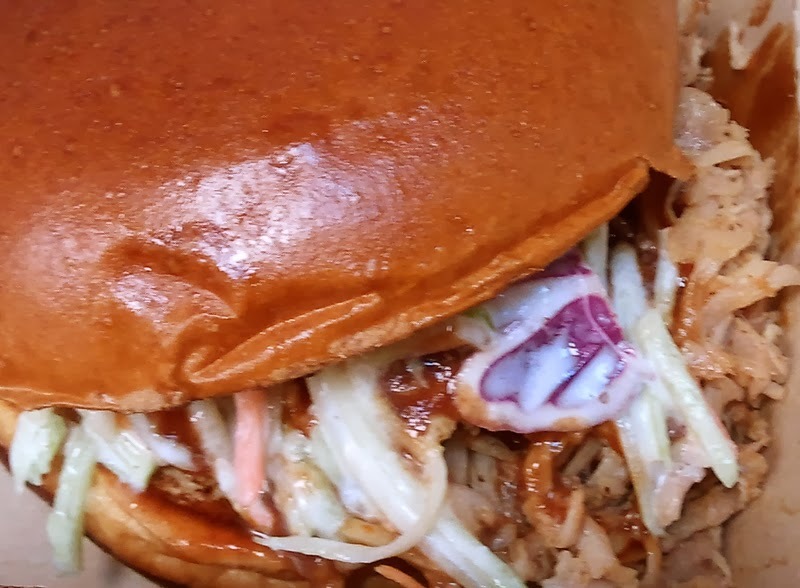 Where else in fast food can you get bbq pulled pork on a cheeseburger? That's premium burger joint level food right there. So that's a success. It's an ever evolving market and I like to see that Wendy's is trying different things and trying to stay relevant. It's fine. Buy one. It doesn't hurt your belly too bad. It doesn't hit the wallet too hard. It's nice to have the option. What if you ordered no sauce, toast the bun, add your own sauce, would it be any better? Why not just raise the pig from Babe, then slow roast and pull it apart yourself if your going thru all that trouble. I had one today..I liked it...something different. got the pulled pork cheese fries too....they would be better without the cheese though. I would get it again.